When you think of it, the Ethiopian knew more than most people; he knew he didn’t fully understand the scriptures. This is one of the defining differences between the Catholics and other Christian churches, we are prepared to accept mystery in our lives, we know there are some things that we shall not fully understand in this world. Actually, the place we see this most is in the Mass. For non-Catholics they have to take away all the mystery of how God can be present with us and say that the Mass is just a symbol of Jesus among us. To understand fully the Mass we have to be humble enough to know that there are depths to this sacrament that shall always be above us as long as we are in this world. The Ethiopian official displayed the kind of heart that is necessary for the Christian, a heart that is willing to accept the word of God as the word of God and not some human construction. The Christian mind-set is one that is open to mystery, is willing to understand that there are things in life that we have to wait for God to reveal to us and that if he chooses not too then we have to accept that as well. To the secular mind this attitude appears silly but to us who seek the Truth we know that Jesus will always provide us with what we need for the day, and part of that is enough knowledge to make the journey interesting. The journey of the Ethiopian official was a lot more interesting after he met Philip! Yet on the other hand, we are told that Philip went to a town in Samaria and preached the good news. He received many converts. So here we have this dichotomy, a seeming contradiction: the Church is being severely persecuted and yet is continuing to grow. It is the same today. All over the world the Christian faith is ridiculed, ignored and while it is not physically persecuted in the West, a Christian is no longer allowed to hold Christian principles in public in many places. But something wonderful is being celebrated at the moment: the resurrection of Jesus and the fact that his resurrection is the sure guarantee that we will live forever with him. This is the good news that Philip preached to the people of Samaria, Jesus is risen, death no longer has any power over us and the love of God for us is so strong that not even death can separate us from him. The message of our faith is so different from that of the world. When the world has a problem with life they just kill it, be that the people of Iraq or Libya. This week we are seeing so much dilly dallying over the boat people of the Middle East, those trying to escape conflict and Europe letting them drown in the sea. Watch over the next few weeks how governments promise much and then back track: the poor trying to get to Europe are not that important. Yet in the eyes of God all people are equal, he has no favourites. That is a wonderful teaching in itself, that all people are of equal value in the eyes of God. It’s a pity that we think of the white western person as that bit more valuable! In recent times we have seen the killing of the Egyptian Coptic Christians in Libya and this weekend we had the killing of the Ethiopian Christians in the same land. Both groups of men were martyred by this group called ISIS. One of the most beautiful things I have heard in recent times is the fact that as these men were killed they could be seen calling on the name of Jesus just before they died. The reason is very simple; Christ and Christianity show up the evil in this world. If you look at the hatred that the secularists have for the church you will get some idea of what I am talking about. The secularist wants to be able to decide what to do for themselves whereas the Christian knows that the Law of God is what we should follow, although many of us find that hard. When you have someone who lives a life that directly points out that your life is wrong, what else will you do but hate them. Stephen, we are told, saw the glory of God, and this removed all fear from him. We can be sure that as these modern martyrs died, God was with them and gave them the grace of consolation. You never know, perhaps there was a Saul among those who watched the proceedings! Today we have the story of a couple of men who feel that they have lost everything. Who has not felt like that manys a time? They are on the way from Jerusalem down to Emmaus after their great hopes have been raised and then let down. This Jesus promised so much, had all the hallmarks of a great leader but in the end he turned out to be just like the rest of them, unable to fulfil what he had promised. Our two friends were in despair: we have all been there. As they walked along they were joined by a stranger. They were surprised that the stranger did not know what had happened in the city over these past days. The stranger was Jesus and as they walked along Jesus pointed out to the men how they had missed the whole point of what his life and death meant. Eventually the men realized who they were speaking too and Jesus disappeared. In their excitement the men headed back to the city to seek the others. When they found them, they were told that they were not the first to see the risen Lord, Peter had also seen him. That’s the way it is with us. When we think we know who Jesus is he shows a new side to himself; he is always new and never quite what we expect him to be and he is not bounded by our expectations. No matter how much we try not to we always have an image of God and Jesus, of what we expect them to be and do. This is human nature and comes from the fact that we have to figure things out in order to function. But God is so much more than that. Who would ever have thought that a man would lay down his life and that he himself would pick it up again? 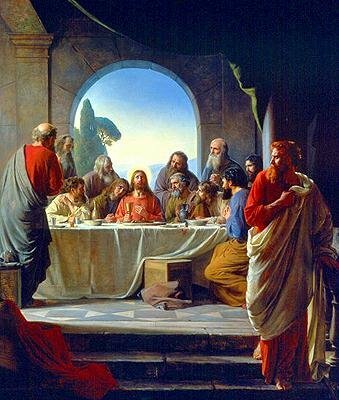 When you think of it, the disciples on the road to Emmaus recognized Jesus at the breaking of the bread—what kind of imagination has God who thought of staying with us under the appearance of bread and wine. Only God would have thought of that one! In the first reading today, from Acts 2:36-41, Peter tells us what happens and what we should do when we encounter the Risen Lord. His message is very similar to that of Jesus himself: repent, be baptized and receive the Holy Spirit. According to this story from Acts, the rapid spread of the Church was about to begin; 3,000 people were said to have joined the followers of Jesus on this occasion. The effects of the resurrection on the people who physically witnessed it must have been dramatic; to see someone alive and well, someone whom you had seen die a horrible death, and who had foretold that he would die and rise, this must surely have changed the lives of the apostles in a dramatic way. It is supposed to be the same with us. We drift through life never quite sure where we are going until the time comes when we meet the Son of God and something happens within us that changes us forever. 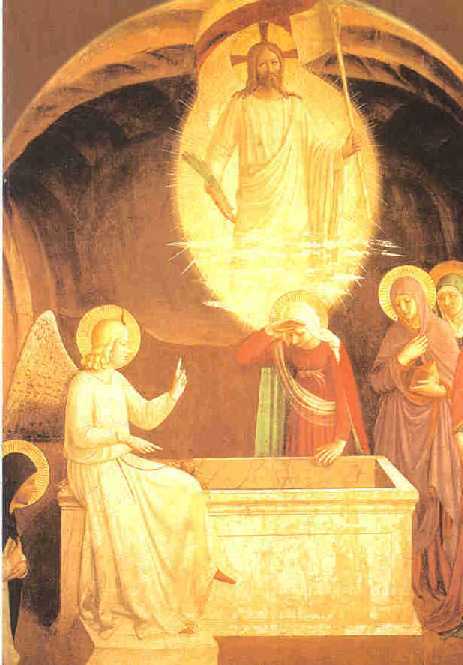 At this point the resurrection begins to live within us. No one can share with you what this is like; it is one of those spiritual experiences that are unique to every one of us. I can never adequately tell you what it is like because God has made my experience so that it fits my life perfectly. Only God can do this, only God knows us that intimately. Whatever happened to Peter, he was now able to preach the Word in such a way that his words became real for people. We see this even today; look at the way the words of Pope Francis inspire so many people. The message of Christ always makes sense to those who are ready to hear it. Mary Magdalene learned a lesson in today’s gospel. When she tried to cling to Jesus he told her to let go of him, he was going to his Father in heaven. What is he telling us if not to let go of old ideas in order to let new and better ideas enter out heart. We should always be open to the new word that God wants to give us. There seems to be something amiss today. Perhaps it is the fact that over the whole Catholic world there is no Mass celebrated or is it that we are aware that we are remembering the death of Jesus. Today is the day he lay in the tomb. Mary is heartbroken, the Pharisees are elated; they have won the great victory over God. We are waiting; this cannot be real, Jesus cannot be gone for ever. He gave us such great hope, he worked the miracles in our lives and we have come to know him. Where has he gone? If we have been attentive to the readings and services over these past few days and if we have reflected on the story that is unfolding then we shall have some idea of what the disciples were feeling. There is an air of expectancy hanging over the world, a feeling that this is an unreal situation and that something has to happen to break the atmosphere of doom. So many times in our lives we enter these periods: after the death of a loved one, the breakup of a marriage or the loss of a job. 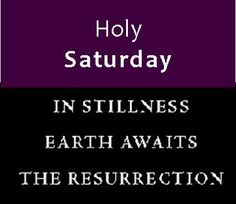 In these huge life changing events there is always a time of transition, a time of change: there is a Holy Saturday. In life the Holy Saturdays that we go through can last a long time. But there must always be a Holy Saturday before we can have an Easter Sunday, the death must come before the Resurrection. When we lose a relationship, a friend or whatever, we have to wait until the time comes when we can use hindsight to see where God was in the middle of it. This requires faith and causes a real growth in faith. Imagine the faith Mary and the disciples needed on Holy Saturday. You don’t get much darker than a day like this. But do not fear, the light is coming! This day has come down to us as by the name of Spy Wednesday. Traditionally it is the day on which Judas spied on the Lord before handing him over to the Jews. Judas has become a name that is hated; we use the word for someone who has carried out a despicable act or has betrayed our trust. The passion really starts here when Jesus begins to feel the betrayal of one of his closest friends. Being let down like this is terrible. Then there is the element of greed: “What will you give me if I hand him over to you?” We are down to the monetary value of a friend. The price put on the Son of God, who had done nothing wrong and had only done good, was the price of a slave, 30 pieces of silver. We are strange creatures us human beings; we are so wrapped up in our worldly issues that we cannot see when something good is happening for us. We are moving on towards the big showdown. The plot is being played out in front of our eyes: Judas has made his decision and still the Lord waits for the will of his Father to unfold. Will Judas go through with it, will Jesus give in….these are the questions hanging in the air. If we try to imagine ourselves in the throng of the city, listening to the people talking about Jesus and whether or not he will come up to the Festival, we get some impression of the tension building. Lest we forget, this is the week that seals the fate of all mankind, this is the week when history changed forever. And we live it out every day of our lives: Holy Week is part of everyday life.